Virginia Tech dealt with some late drama, but rallied to defeat Boston College 85-80 in overtime in the Conte Forum on Wednesday night. The Hokies won their third game in a row, improving to 16-6 overall and 5-4 in the ACC in the process. The Eagles dropped to 13-9 overall and 3-6 in conference play. 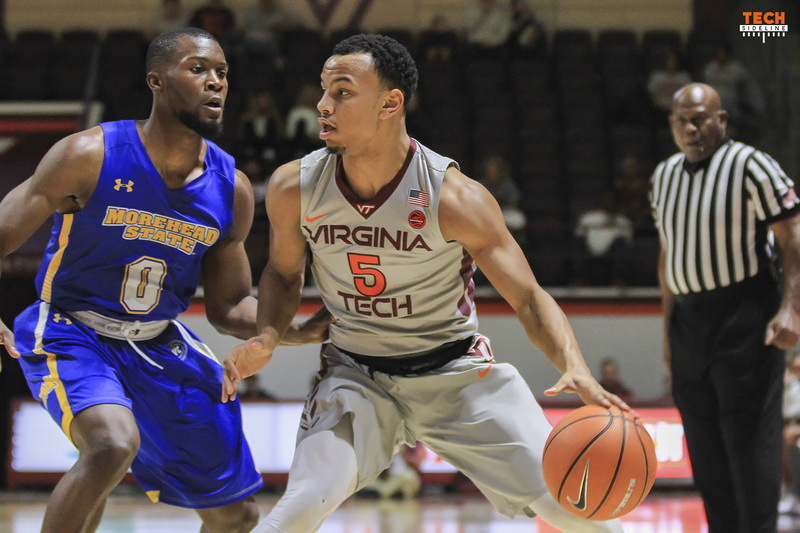 Tech did not trail in the second half, and in fact led by as many as 12 points when Justin Robinson drove the lane for a layup to make the score 62-50 with 8:05 remaining. The Hokies had previously wrestled control of the game away from Boston College late in the first half to take a 34-29 lead into halftime, and all VT fans were feeling confident at this stage of the game. But things got tough down the stretch. On Saturday night against Notre Dame, Chris Clarke made huge plays down the stretch to cement a Virginia Tech victory. On Wednesday night, his error with 1:02 remaining in regulation nearly cost the Hokies the game. With 1:02 left to play, Justin Robinson was called for a foul on a Jerome Robinson three-point attempt with Virginia Tech up 71-64. Clarke doubled down on the foul by getting whistled for his own technical foul, and the result was BC’s Jerome Robinson making five consecutive free throws to take the score from 71-64 to 71-69 with no time coming off the clock. BC’s Robinson then made two more free throws with 22 seconds remaining, and both teams missed late shots that would have won the game. This one was heading to overtime, and Chris Clarke went to the bench for the final five minutes to brood on his mistake. Boston College took the lead early in overtime, going up 77-76 with 3:13 remaining. However, Virginia Tech took control down the stretch, outscoring the Eagles 9-3 to walk away 80-75 winners. Back-to-back-to-back three-pointers from Justin Bibbs and Nickeil Alexander-Walker transformed a 77-76 Boston College lead to an 82-79 Virginia Tech lead, with a dunk by BC’s Nik Popovic accounting for the Eagles’ two points. Kerry Blackshear hit a layup with 1:22 remaining to make the score 84-79, all but sealing the deal for the Hokies. Robinson has never had a three-game stretch like that in his career during ACC play, and his performances have helped lift the Hokies from being 13-6 overall and 2-4 in the ACC to 16-6 and 5-4. Of course, Robinson wasn’t the only player to make a big impact against Boston College. Kerry Blackshear led the team in points (20) and also finished with eight rebounds, while Justin Bibbs and Nickeil-Alexander-Walker had 18 points each. Both Bibbs and Alexander-Walker were 7-of-14 from the field. Bibbs was 4-of-7 from three-point range, while Alexander-Walker was 4-of-8. Despite his late mistake, Chris Clarke contributed with six points, a team-high nine rebounds and four assists. As a team, the Hokies had 19 assists on 30 made field goals, and turned the ball over only 10 times. Meanwhile, BC had 16 turnovers, and those six extra possessions for Virginia Tech were critical to the outcome of the game. After winning three straight games, including two consecutive road games, Virginia Tech will return to Cassell Coliseum for a pair of home games against Miami and NC State. First up is Miami. The Hurricanes will face the Hokies in Blacksburg this Saturday. Tipoff is scheduled for 2pm, and the game will be televised nationally by ESPN. Virginia Tech has already announced that the game is a sellout. Suggest laying off Chris Clarke. The whole offense revolves around him and JR. And Clarke is by far the best rebounder. He is a phenomenal player and I’m sure a great person. So he made a mistake and paid the price and we fortunately survived. Think Grayson Allen, what a brat! My guess is that Clarke was frustrated that every BC trip down the floor in the home stretch resulted in a foul. Did anyone else notice that once we got that lead up to 12 we stopped running our offense and tried to play keep away to run clock. This resulted in several rushed shots as the shot clock was close to expiring in the last 4-5 mins of the second half. Combine that with failing to guard Bowman during that stretch and some questionable foul/no-foul calls and the BC’s comeback was guaranteed. I saw the opposite. Once we got into crunch time, we were pushing the ball up the court in a hurry; leading to foolish boom-boom turnovers by Robinson, NAW, and Clarke. Clarke’s frustration with himself on the TO likely led to his T a few seconds later. With the lead in the waning minutes, we need to calmly maintain possession and run our offense, looking for a good shot and burning clock. Take advantage of a fast break opportunity if one presents itself, but don’t force the issue. Close basketball games are won by the team that maintains its poise and presence of mind down the stretch. We lost ours towards the end of regulation and nearly lost the game as a result. We re-discovered our poise during the overtime and prevailed. I think you may have misunderstood my comment. When we got up by 12 with somewhere near to 8 mins left, we stopped running our offense and looked to run clock. With BC’s 3pt shooters (Bowman & Robinson) that is not a large enough lead to with that much time to stop running our offense. The result was that when BC started cutting into the lead, we started to pressing on offensive which led to the turnovers. Nerve wracking ending for sure but a win we had to have! I guess all’s well that ends well but if we had lost in OT I think we would be discussing the move to sit Clarke the entire OT as a punishment. BW is a man of principle and we respect that but I don’t know if a technical foul merits sitting out the rest of the game unless he felt CC was completely out of control and might do it again. Of course what was said can matter and I don’t know what that was. Agree, Clarke’s Technical is now an inconvenience to the win. I didn’t go ballistic with the Technical, but I was upset and thought OH NO! But with good OT play and win, it becomes just an incident; but also a learning experience for keeping your head in the game. Hopefully, the other team will do something stupid and Tech comes up with the win. The technical was actually preceded by a mental error by Clarke. With 1:02 remaining and we were up by 7, Clarke rushed down the court and into 3 BC defenders, lost control of the ball, may have been fouled, but turned it over. He was probably trying to do what he did at ND late in the game but did not need to…should have stopped at midcourt and burned some clock. It appeared to me (I could be wrong) that he was “discussing” with Valentine that he thought he was fouled. Just my view. I still have confidence in him and I am sure that Buzz has too, but we need to protect the ball when the game is in our control. I have a very different perspective and disagree with at least 2 of the comments in this thread. Clark was disrespectful to the Ref and followed it with being disrespectful to his coach….in his rage, he tried to brush Coach Bud off (actually bumping him with a shoulder) and pulling away from him in front of his teammates and a Nationwide TV audience. I have witnessed this behavior from Clarke before and i don’t like it. He thinks being a scrappy hot head and showing uncontrolled hype & passion is an acceptable part of his game. He is trying to be an energizer battery like Zach LeDay but he is not doing it in the same class fashion as Zach or Bud would like. I agree that Chris can be an asset but Chris better eradicate this behavior from his game or he will find himself on the bench permanently regardless of how many games we lose. Saw that but I think Buzz handled it well by staying calm but not letting him just walk away. Thanks your right…Coach Buzz….still in pain from the football season I guess and got Bud on the brain. Can someone please explain to me what that TF was all about? No replay, no explanation, total mystery…Otherwise, huge win…that’s 3-straight to close out first half conference play @ 5-4, including 3 – road wins, as many as we had all of last season. I’m encouraged by the mental toughness of this team. Why is BC wearing Morehead State’s unis? I agree – that was their first mistake. Their second was putting free-throws ahead of regular baskets. It worked very well but it just wasn’t enough. ha ha. Buzz demonstrated tremendous leadership by benching Clarke in the closing minutes of the 2nd half and OT. As a fan, I hated the move because Clarke is such a dynamic player and was the most impactful player down the stretch of the ND game to seal the win. He definitely could’ve helped us. However, the technical appeared to happen while Clarke was talking to the official (full disclosure, I never got a good angle to see what happened but it occurred in front of the Tech bench so I trust Buzz) at a pivotal moment in the game. Clarke needs to have better situtional awareness in those moments. Buzz was able to have a teaching moment with arguably our most versatile player sitting on the bench at crunch time while still preserving the win. That took serious guts because it was a hard thing to do but the right thing to do. I don’t think I would like to have been Chris Clark on the trip home last night. He lost control of the ball rushing down court giving it to BC and on the next play committed the tech. On his way to the bench BW’s mood did not appear to be the best. Clark is so good and valuable to the team. He just needs to play under control at critical times. Where did that last foul occur? I did not see it on the telecast. Was Clark’s technical due to a comment to an official? Gritty performance facing endgame adversity. Good job Hokies! Hold service against the Canes! It looked like a touch foul . JR may have touched Robinson (not confusing much) from behind since JR was behind him when the shot was taken, but the fall sealed the deal. My guess is CC said something in exasperation and the ref was very quick with the whistle. Quite a decision by the ref with a minute left. I felt like the last 4 minutes of regulation BC got a number of home calls (things that weren’t called in the first 36 minutes), but give them credit for making their FTs. CC also made some questionable decisions in the last minutes, pushing the pace when we should have been running clock. That lead to some unnecessary turnovers, including a drive in the lane with less than a minute and plenty of time on the shot clock. That game is won (comfortably) in regulation if the refs don’t intervene and the team plays a little smarter. I think that drive in the lane that resulted in a turnover was just prior to the technical foul so there was more than a minute left, not less. It was not a good stretch for CC, and hopefully CC will learn from it. He’s too good to leave on the bench in tight games! Chris, no big deal but 5’s assists and points for BC are reversed. Other corrections: You can’t say VT never trailed in the 2nd half if they trailed 77-76 in overtime. And VT didn’t walk away 80-75 winners (it was 85-80 and earlier in the paragraph there is reference that BC had already scored 77). Good insight because I didn’t see the last 4 minutes + OT. Glad we won but, ouch, we need to be thinking more about the score and time left in the game when picking up a T.
Technically, isn’t CC correct. As I view it, you have a 1st half, a 2nd half, and OT. CC is correct. BC never led in the 2nd half. They led by 1 in OT.